Water kefir grains create a carbonated lacto-fermented beverage from sugar water, fruit juice, or coconut water. Incredibly easy to use, the starter culture can create a new batch of water kefir every 24-48 hours. Water kefir makes a fantastic non-dairy alternative to milk kefir and can be flavored to make a range of delicious beverages, or as an ingredient in many recipes. Your family will love it! Each box contains 1 packet of traditional heirloom-style water kefir grains. 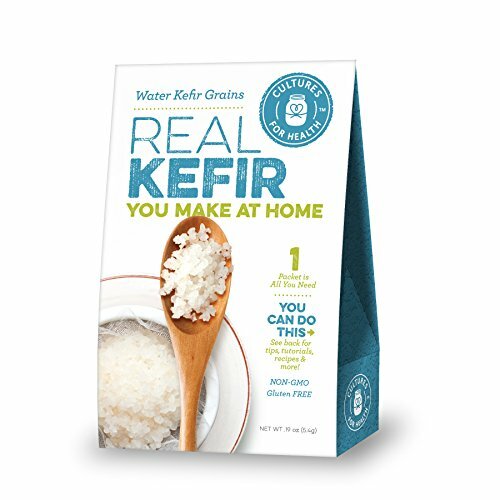 Dehydrated kefir grains, are easy to use, safe to ship, and rehydrate in just 3-4 days. This culture is reusable; makes up to 2 quarts water kefir with every batch-one packet is all you need. Complete, easy-to-use instructions are included in every box. Ingredients: Organic sugar, live active cultures. Non-GMO. Allergen Information: Our Water Kefir Grains are a gluten-free product (<5ppm). They are manufactured in a facility that produces products containing soy and dairy. Actual product packaging may differ from image shown above. Manufacturer: Cultures for Health Inc. Publisher: Cultures for Health Inc. Studio: Cultures for Health Inc.